The Enova value of Customer First means exactly that — all decisions should be made with the ultimate goal of satisfying the customer’s needs, and business results will follow. In fact, before pursuing any new opportunity, the first question that should be asked is, “Does this help the customer?” By treating the customer as the company’s most important relationship — as it should be in any consumer-facing environment — you are ensuring a strong, long-lasting relationship that will generate significant value for both parties, regardless of the product. There are two important factors in this process: The first is listening carefully to customers’ feedback, and the second is anticipating their concerns and needs. In doing so, we are able to identify products and opportunities that will match. As soon as a company ceases to listen or anticipate, it starts doing business for itself, which will quickly result in a loss of trust, and ultimately, lost business. And it’s not only about what you are doing for the customer, but how you are treating them along the way. Integrity, honesty and transparency are words that come to mind, and concepts that need to be present at every touch point we have — from the initial customer inquiry, to after the sale has happened. 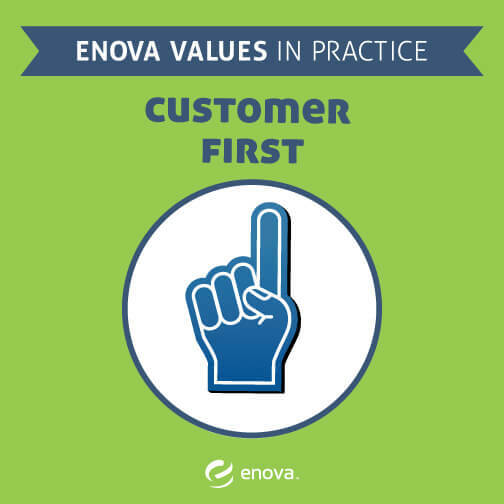 Customer First is Enova’s most important value, and we will continue to succeed as long as we adhere to it.